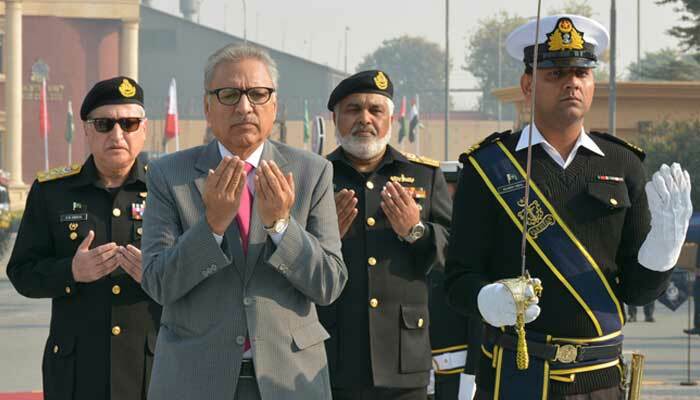 ISLAMABAD: President Dr Arif Alvi has said that the armed forces of Pakistan have more experience than other forces of the world in combating terrorism. He said that for Pakistan’s economic prosperity, focus on the maritime sector and its development is not a matter of choice rather a matter of compulsion. “It is time that we must develop credible solutions to the issues we face in the development of maritime sector,” said President Alvi, while speaking at the second Maritime Security Workshop (MARSEW-18) under the banner ‘Blue Economy--Prosperous Pakistan' which culminated at the Pakistan Navy War College, Lahore. Concurrent to the closing ceremony of the workshop, the first Maritime Doctrine of Pakistan was also launched. President Alvi graced the occasion as the chief guest. The Chief of the Naval Staff, Admiral Zafar Mahmood Abbasi, was also present at the impressive ceremony besides senior civil and military dignitaries. Emphasising the significance of Blue Economy, the president remarked that resource scarcity on land has forced nations to turn their gaze from land to sea. Dr Arif Alvi further added that Institutionalisation of Maritime Security Workshop is a remarkable and a well-timed initiative by the Pakistan Navy. It provides an insight and a good grasp over what tremendous potential maritime sector holds and the extraordinary role of the Pakistan Navy to spearhead various initiatives to tap these resources for the country’s economic prosperity. At the launch of the Maritime Doctrine of Pakistan (MDP), the president hoped that the MDP would be a trendsetter and would go a long way in laying a foundation for promotion of the maritime sector for the present and coming generations. The document is an effort to lay the foundations for a greater understanding and awareness on matters related to oceans and undertaking of multiple peace and war time roles by the Pakistan Navy. Certainly, MDP will act as a stimulus in sensitising the public at large, shape opinions and become instrumental in providing a sense of direction to the national maritime sector of Pakistan. Earlier, in his address, the Commandant Pak Navy War College, Rear Admiral Naveed Ahmed Rizvi, expressed his gratitude to the president and Chief of the Naval Staff for their worthy presence at the occasion. While signifying MARSEW-18, the commandant said that this workshop has provided a forum for a better understanding of the maritime affairs and associated matters by the legislative body, bureaucracy, academia and private sector of the country. President Dr Arif Alvi also laid a floral wreath at the Yadgar-e-Shuhada at the Pakistan Navy War College. In the end, the participants of MARSEW-18 were awarded certificates by the President of Pakistan. Second of the series, the Maritime Security Workshop encompassed on campus discussions on maritime potential of Pakistan, the maritime environment, blue economy, and national maritime policy and strategy. During the second leg of the workshop, the participants visited the Naval Headquarters, Islamabad, Pakistan Navy installations and units at Karachi, coastal and creeks area for orientation and familiarisation. The members visited important maritime organisations like the Karachi Shipyard & Engineering Works (KS&EW) and Karachi Port Trust (KPT). The participants also had a sea trip on board Pakistan Navy destroyer and later briefed on the Pakistan Navy command structure and coastal as well as creeks area defences. Tour of Gwadar Port and briefing on in-progress CPEC maritime related projects constituted the pinnacle of the visit.